“In South Africa, the political problem was solved and then the Truth and Reconciliation Commission came into being. 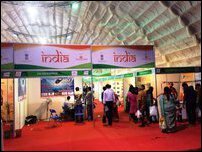 Before all these things, the necessity of solving the national problem or the Tamil problem looms large,” said NPC Chief Minister Justice C.V. Wigneswaran, who was invited as a guest to the Colombo and New Delhi centric business exhibition Jaffna “International” Trade Fair” (JITF) held for the 8th consecutive year in Jaffna on Friday. The Chief Minister was also conveying the reservations of the native people in the North to the big-scale external investments not sensitive to the economic culture and concerns of the war affected population. Although the entire island is globally ranked as a ‘Middle Income Country’, the conflict and war affected homeland of Tamils in the North-East is below the poverty line according to the global standards, the CM further observed. The Chief Minister's comment on the significance of resolving the national question before everything else was a direct response to the remarks that came from the Indian Consul General to Jaffna Mr A Natarajan, who was complaining abou the lack of big investments and collaboration between Indian investors and the local actors. 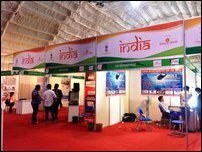 Around 75 to 80% of the 300 stalls in the exhibit, organised by Colombo-based Lanka Exhibition and Consultancy Services (LECS) Pvt. Ltd. in association with the Chamber of Commerce and Industries of Yazhppaa'nam (CCIY), were occupied by the Indian business actors. 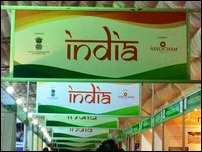 But, business actors from Tamil Nadu were largely absent in the big delegation of India. Tamil diaspora participation was also nil. The Chief Minister was also speaking about the significance of preserving secular values and the parity of status based on linguistic identity. India achieved a self-sustained economy as its founders were concerned about these values, the Cheif Minister said in his address. He also didn't fail to note that any real development, reconciliation and to maintain the individuality of the culture in the North would only be possible through ending the military occupation. The [Sinhala] military and its relatives from South are competing with the local people occupying their lands and livelihood, he said. SL Minister of Primary Industries Daya Gamage (UNP) and Jaffna District UNP MP and SL State Minister of Child Affairs Vijayakala Maheswaran (UNP) accompanied the Indian Consul General and NPC CM Justice C.V. Wigneswaran as the guests of the event. The opening event of the JITF also coincided with the Indian Republic Day on 26 January.